As one might imagine, in the weeks leading up to Lucas’s arrival in the world, Jennifer and I were making space in our house. His nursery was originally our spare bedroom, and we had been using its closet as a storage location. Needless to say, we needed to consolidate our storage, especially as the closet would now be needed for his stuff. Some of the containers from the nursery closet needed to be moved into my office closet. In order to make space, I decided it was time to get rid of some of my classic video game library. In particular, I chose to get rid of almost all of my old Atari 2600 and ColecoVision cartridges, as I no longer had working hardware to play those games. I kept the NES and SNES cartridges, as not only do I have (presumably) working consoles for them, there are modern consoles available that are able to play those cartridges via emulation. In the end, I took a few bags full of cartridges to Game Over Videogames off the Southwest Freeway, and sold them for a nice bit of store credit. A few days ago, I ended up moving a print off my office wall to replace a print that had been moved out of our bedroom, which left space on my wall for the shadowboxes. I mounted them last night; I think they ended up looking pretty good. The displayed Atari 2600 cartridges. Granted, one can’t tell that the Space Invaders cartridge is actually Space Invaders. The cartridge is a Sears Tele-Games rebrand, which my parents had bought for me along with a Sears Tele-Games rebranded Atari 2600 for my seventh birthday. As much as I wish they had the original game artwork like the original Atari cartridges did, they instead looked kind of generic. 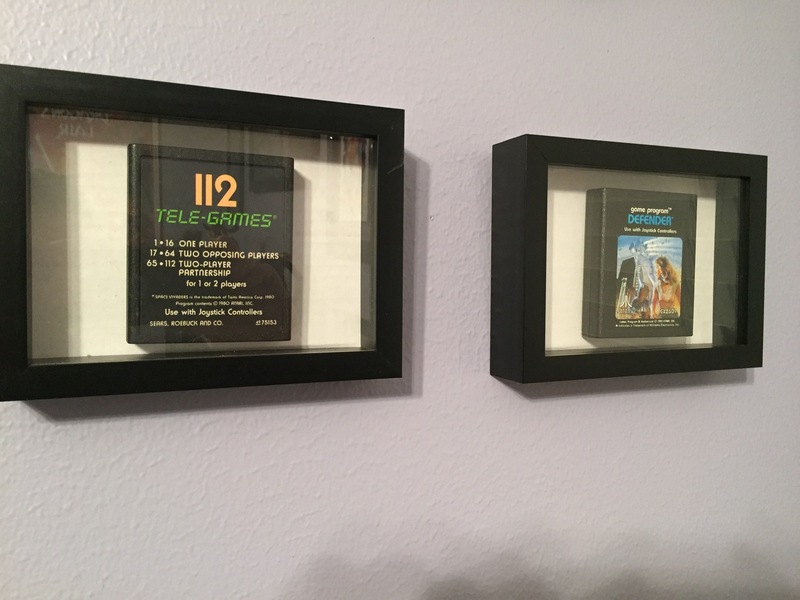 I briefly considered buying an actual Atari cartridge and displaying that instead, but I decided that I wanted to reflect what I actually started with.